Sometimes an album comes along, an album that you love instantly. It does not happen very often, Copper Blue is one of those instant classics for me. I love the wall of guitars, the noise, the fantastic melodies, the pop-music sensibillity, the rock’n roll kick to the groin. I just love it! This is pop music, power-pop at it’s very best. (Copper Blue)… Of course, it was released just as the seeds sown by his former band were bearing bountiful fruits in the post-Nirvana alternative nation, which provided ample explanation for its phenomenal success. But Sugar were well deserving of their success, regardless of time and place. A more aggressive, contemporary guitar attack aside, stunning power punk masterpieces like “The Act We Act,” “The Slim,” and “Fortune Teller” bear all of the vintage Mould musical traits: tell-tale lyrics, great hooks, and snappy melodies. It’s all underpinned by that unexplainable, chilling tension between innocent beauty and dark melancholy that fans came to expect from Mould, and topped by his somewhat nasal, almost timid vocal harmonies. Bob Mould was a member of one of the most influential rock bands in America, Husker Du. When Husker Du imploded Bob Mould did the seemingly impossible, he made two fantastic solo albums and then he formed a rock trio and went and made three more seminal rock albums . His creative streak these few years are comparable to Stevie Wonder in the early seventies or Bob Dylan in the mid sixtees, he was bursting with creative power. And his output is of staggeringly high quality. 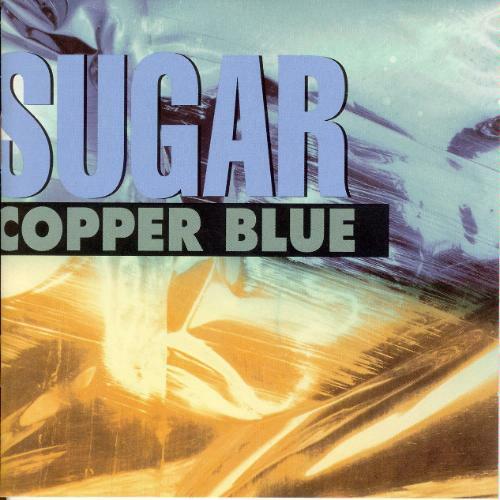 Bob Mould and bassist David Barbe plus drummer Malcolm Travis formed the three-piece that was called Sugar, and recorded Copper Blue with Lou Giordano co-producing and gave us one of the truly great guitar albums of the nineties. That was quite a feat considering that Cooper Blue came in a decade that gave us classic guitar based rock/pop from The Pixies , My Bloody Valentine and Nirvana to name a fewl off the top of my head. The most astonishing thing about Copper Blue , or rather the sessions that produced the album is that songs for the magnificent follow up album Beaster came at the same time. They are quite different but also very, very good, more about that in a later post…. Bob Mould will be performing Copper Blue in it’s entirety at the Oya festival in Oslo the 8th of August. Copper Blue marked a new chapter in Bob Mould’s career. The album went top ten in Great Britain and there were four single releases from the record. NME named it album of the year in 1992. Sugar was known as an intense and loud live band that didn’t waste time on sweet talking. Bob Mould hasn’t been in Oslo since 1991, the year before Sugar was formed. It’s about time we invited him back. At Øya, Mould will be performing with a rhythm section comprised of Jon Wurster (Superchunk and The Mountain Goats) and Jason Narducy (Robert Pollard). We were extremely excited at the Øya office when we recieved the news that Mould was coming to our festival Wednesday the 8th of August and Copper Blue has been playing on repeat since. This I look forward to!